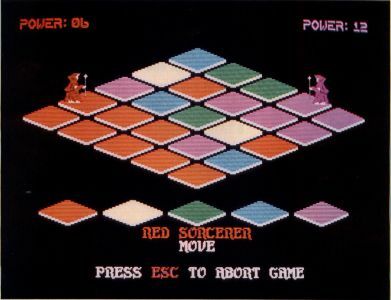 Spectral Sorcery, as the name might suggest, is a game based on colors and a form of magic. It is a strategy board game for zero, one or two players, the game being played on a partial-perspective playing board that consists of a 5×5 matrix of colored squares (pads). The color of each pad can be changed by the players to any one of the five colors in the game's spectrum (red, yellow, green, blue and violet). The object of the game is to convert all of the pads on the board to your color (red or violet, depending on which side you are playing). To accomplish this task, you are provided with a single playing piece (your wizard) and a number of actions that the wizard is capable of performing. The best way to learn to play this game is to watch it in action. So, boot it up and mess around with it. There is online help for just about everything, so you probably won't need to read the rules. The best way to learn to play this game is to watch it in action. So, boot it up and mess around with it. Note that, because of the large size of this program, the listings could not be included in the magazine. The, complete program is available on this month's disk version or in the ST SIC on DELPHI. The game starts with a title/credit screen. If you don't press the space bar (as it suggests), the game will switch to the Options screen after about one minute. From the Options screen, you can set the game controllers and several start-up options (including the board configuration). If you have the mouse plugged in, make sure you don't leave either of the players under the control of Joystick 0. If you do, strange things may occur since the mouse rollers do send signals in along the same lines as the joystick—the wrong ones. After about a minute of complete keyboard idling, the game will automatically start a demo using all of the settings just as they were set before the demo started. You might want to watch a demo before playing, just to get an idea of how the game works. You can interrupt the game with the escape key at any time. Also, the messages that are displayed are intentionally slowed down; you may press the space bar at any time to make the program skip past a message display pause. This game is controlled mostly via Joystick. However, all Options are set using the keyboard. To start with, you set all of the game options with the function keys (Fl to F6), you start the game with the space bar, you get a brief instruction screen with the help key and you use the escape key to abort a game or exit the program entirely. Also, during play you can press the help key to get a description of the action or spell that you want. The joysticks are used to directly control the wizard's movements and to select the actions in the text window. To select an action or a spell, you move the stick forward or backward (to scroll the list forward or backward). The name of the action or spell will appear on the second line of the text window (at the bottom of the screen), just below the player identification line (red/violet). To pick one, you just press the stick button. For information on how to use an action or spell, press the help key (before you actually select the spell with the stick button). When using the joysticks for movement, Up moves the wizard (or teleport target pad) up and to the left; Down moves down and to the right; Right moves up and to the right; and Left moves down and to the left. Try it, it will become easy. This is a game of strategy. The field of play is a 5×5 board of squares. Each square consists of a colored surface (the pad) and a colored edge (the edge). Each pad may, at any given time, be any one of the five spectral colors. (Okay, so there are seven colors in the standard spectrum. Cut me some proverbial slack; I only wanted five.) The order of the spectrum colors is shown in a row of platforms just above the text window. From left to right they are: red, yellow, green, blue and violet. The object of the game is to convert all of the pads to your color and to hold that configuration until the end of a turn. If the board is all one color at any one time at the end of a turn, then the game ends. If the board is all red or all violet, then the appropriate player wins. If it is one of the other colors (yellow, green or blue), the game ends in a draw. This last circumstance rarely occurs since all of the options available to the player are designed to convert things to his or her color. The game consists of an indefinite number of turns. Each turn is broken down into a series of rounds. In each round, both of the players are allowed to take one (and sometimes two actions). After an action is selected, the appropriate amount of power is deducted from the player's allotment for the turn. When both players are out of power (or both choose to pass), the turn ends, some book-keeping is performed, and new power is allocated based on the configuration of the board at the end of the turn. Essentially, a player gets 16 base-power points plus one point for every pad of his/her color on the board at the end of the previous turn. One point is then deducted for every lock belonging to the player that was on the board at the end of the previous turn. Minimum power is always one point; the maximum power is 99 points (assuming that you use the Save Power option). Now that you have an idea of what you are supposed to accomplish, you may be wondering how you go about it. Well, if you have ever played Archon or Archon II from Electronic Arts, you will recognize the overall approach I have taken. At the bottom of the screen, there is a four-line text window where you will see the title of the player who is currently moving, the action that is currently selectable and a few other messages and pieces of information. You might want to scroll through the text as you read the descriptions below. Also, remember that you can get online help as well. Move (default): This action allows you to move your wizard from the platform it is currently on to any one of the eight adjacent platforms. After you select Move, the joystick will allow you to select the pad to which to move. If you try to move too far from your starting pad, or if you try to leave the board, a warning will be printed in the text window, and the attempt will not be executed. When your wizard is positioned on the desired destination platform, press the joystick button and the move will be finalized. While you are moving, the color of the platform you are on will be printed in the text window. If you return to your starting platform, the word "CANCEL" will be printed in place of the color. If you press the button while "CANCEL" is displayed, your move will be canceled, and you will be allowed to select another action. The power used for the actual move is one point. Additionally, if you have more than one point of power when you start your move, and you are moving to a platform that is not your color, an additional point will be expended and the color of the platform will be "tweeked" one level closer to your own. If the platform is already your color, or you only had one power point, then no color change takes place (and the extra power point is not expended). Cast: This action activates the sublist of spells. You then select one of the spells (in the same way you selected the Cast action). If you don't want to cast a spell, then you select the NO SPELL item. See the Spells section below for more info on what they do. Stomp: This action causes the wizard to bounce on the platform he currently occupies. If the pad is not your color, then it is tweeked at a cost of one power point. If the pad is your color, no power is used, and the pad color does not change. It is essentially a null action. Help Me: This action directs the computer to select your next move for you. It uses the same routines that select actions for a computer-controlled player. After the action is selected, control returns to the player. Once this is selected, you can't cancel the action that the computer selects for you. Resign: A graceful way to get out of the game. If you feel that you cannot win, just select this, and the game will end as if it was a tie. However, the fact that you resigned will be displayed (rather than the announcement of a draw). Pass: Take no action for this round. It does not end the turn unless both players select to pass within the same round. Also, if one player is out of power at the start of a round (regardless of who moves first), and the other player selects Pass, the turn will end. However, if the first player passes and the second player takes an action that uses all of his/her power, the turn will not end in that round. Spells can have a drastic effect on the configuration of the board (color layout, that is). Just keep in mind that the spells are all centered around your wizard. So, any reference to the origin of a spell refers to the location of the wizard at the time that the spell is cast. Convert: This changes the color a pad (through a series of Tweeks) to the player's color. It costs one point per each Tweek that is required to reach the player's color. So, the cost can range from one to four points. If you cast this spell on a pad that is already your color, the pad color wraps to the color of your opponent (at a cost of one point). This has its uses, especially when you want to setup for a "Blitz." Teleport: This spell lets you move your wizard to any other platform on the board (if you have sufficient power). The cost is based on the color of the destination platform. Teleporting to a platform of your own color costs one point, while going to a platform of your opponent's color costs five points. Figuring the cost of teleporting to the intermediate platform colors is left as an exercise to the reader. When you activate this spell, a multicolor pulsating cursor will cover the surface of the origin platform. You move it around just as you would move a wizard, but you have no range restriction. As you move it, the color of the pad that is covered will be displayed. If you return the cursor to the origin platform, "CANCEL" will be displayed. When you press the button, the computer will check to see if you have enough power to teleport to the desired destination (or cancel the teleport if you picked that). If you don't have enough power, you get a message and have to pick a different spot. If your power is sufficient, you get whooshed off to the new location. Blitz: This spell is kinda hard to describe. (I'm a linguist, so I can use words like "kinda.") Officially, it is a recursive Tweek that expands laterally and vertically from the origin. As it expands, it treats each of the platforms that it affects as if it were also an origin platform. In words, it looks at the color of the origin platform and remembers it, then it tweeks the origin platform. Next, it looks at the four platforms that are adjacent to the origin (diagonals are not adjacent for this). If an adjacent pad is of the same color as the origin was before it was tweeked, its location is placed in a queue. After all adjacent platforms have been checked, the first platform entry in the queue is retrieved and that platform becomes the new origin. The procedure above repeats until the queue is empty. When the queue is emptied, the program returns to the original origin and attempts to repeat the entire process with the new set of colors. The end conditions are: (1) all power used (since each tweek uses one point), (2) the origin and all platforms in the queue are already the player's color. One implication of (2) is that casting Blitz on a platform of your own color will have absolutely no effect. An implication of (1) and (2) is that this spell can quite easily (and often does) use all of your power in one massive shot. Also, since this is such a powerful spell, I have made the assumption that the wizard must have a certain amount of energy to "ignite" the spell. You don't necessarily use all of the power, but it has to be there in potential, in order for the spell to get its initial kickoff. If this description is not clear, I suggest you put the game into two-player mode and experiment with Blitzing different places. You will get the idea after a while. Transmute: This is a straightforward spell that affects the large group of nine platforms that are centered around the wizard's platform. If you're on the edge of the board, then it may only affect four or six platforms. What happens is that each platform in the transmute zone is tweeked in the same way they would be tweeked if you were to stomp on each one of them. The cost is one point per platform that actually undergoes a color change. Also, since this too is a rather far-reaching spell, it requires the player to have a nine-point power reserve in order to "ignite" it. Once again, this ignition power is not actually expended, it just has to be there at the time the spell is engaged. Lock: This places a lock on the platform occupied by the wizard. A locked platform's color cannot be changed by any means until the lock is removed. The cost depends on the color of the platform relative to the color of the player. Platforms far from your color cost more to lock than platforms close to or of your color. This is a good way to block a Blitz, since a locked platform functions as if it is a totally unique color (that does not match any other color on the board and therefore cannot be Blitzed). Also, if Convert or Blitz are cast while the wizard is on a locked platform (regardless of who owns the Lock), the spells will fail, and the player will lose his/her action for that round. At then end of a turn (not just a round), all locks are counted. For every lock remaining at the end of a turn, the player will lose one point of power from the pool of points that are awarded at the start of each new turn. Since it is theoretically possible for a player to have more locks than power points (16 base points - 25 locks), there is a provision that a player always be granted at least one point of power (to cast the Release spell). Unlock: This removes a Lock from the platform occupied by the wizard. If the Lock is one of your own, there is no cost. If it is a Lock placed by your opponent, the cost is just as if you were placing a Lock. However, in addition to that standard power requirement, there is an adjustment made based on who has advantage on the board. For every five platforms that the player has over and above the number of platforms that his opponent has, one point is added to the cost of the Unlock spell. What this means is that it costs more for the player with the board advantage to remove Locks than it does for the disadvantaged player. One special feature of this spell is that it does not count as an action. If you Unlock a pad, you can still take another action or cast another spell. Release Locks: This spell removes all of your Locks from the board at a cost of one point. It is here in the off chance that you somehow manage to get so many locks on the board that you don't have any power to do anything. Since this has yet to happen (in over two years of playing this game), I don't know if this is really a useful spell. No Spell: This is what you pick if you don't want to cast a spell. It returns you to the Action selection list, doesn't cost anything and you don't lose your turn. The routines I wrote to make the computer play against you are extremely simple. Nevertheless, you will probably lose the first few times you play against it. Of course, if you are a chess master, it might be a piece of cake to tromp. What you are playing against, in a very real sense, is the board itself. The "brain" of the computer decision algorithm is essentially a cellular automaton (the platforms on the board). The computer's wizard marks the active cell and each cell can see the current state of all the other cells on the board (not that it uses all the information available). So, all moves are based merely on the state of the board prior to the computer's move. There is no look-ahead, no review of past moves made by the player. In short, there is no artificial intelligence in this game. It is a completely deterministic, cellular automaton designed to provide you with at least a minimal challenge (which is what I expected at first), with the minimum of coding effort.